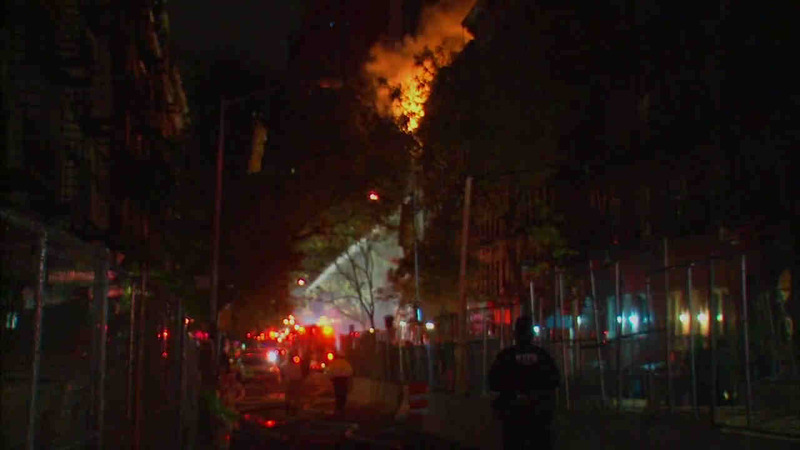 A five-alarm fire is burning through a building on the Upper East Side. UPPER EAST SIDE, Manhattan (WABC) -- A group of FDNY firefighters will be honored on Tuesday by the New York City Council for their daring rescue of a man from a fire on the Upper East Side last month. Representatives from the FDNY, along with firefighters from Rescue 1 and Engines 53, 91, 58, 76, 44 will be on hand to receive a Proclamation from Council Member Ben Kallos at City Hall. 81-year-old Jim Duffy was trapped on the fifth floor of an apartment building on East 93rd Street that quickly became engulfed by fire. Firefighter Jim Lee from Rescue 1 was one of the many firefighters called to the scene and performed the daring rescue. Lee was lowered down from the roof on a rope, saved Duffy from a window, and then lowered him to the ground, where just seconds after touching down, the rope used in the rescue burned through. One person was killed and more than a dozen others were injured in the fire.